Find hotel near Santa Marta Lighthouse Mu .. The lighthouse of Santa Marta is a beautiful monument where the ocean begins and Cascais ends. Given Portugal’s connection to the sea based explorations as well as a thriving shipping industry, it is easy to imagine the indispensable role that lighthouses must have played in its history. The Santa Marta Lighthouse Museum is an initiative to explore the science and heritage behind Portuguese lighthouses. Apart from the museum, the attraction has an ancient fort and a functional lighthouse on the premises. The fort had been constructed in mid-17th century as part of the region’s coastal defence. The lighthouse began operating in 1968 and was fully mechanized in 1981. In the museum, visitors can see lighthouse optical devices on display. The technological history of Portuguese lighthouses is put forth through various symbolic artefacts in exhibition. 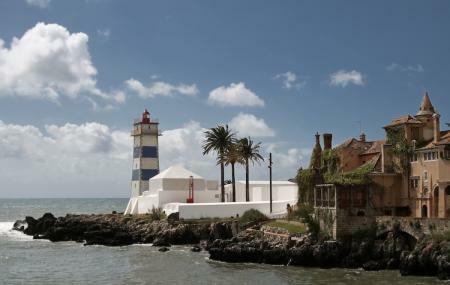 Watch a small, multilingual documentary on the lighthouses of Portugal which provide a general outline of the museum’s collection as well as introduces the visitors to 5 centuries of maritime history. The lighthouse keepers have long retired. But the museum recreates the fascinating nuances of their profession through a 3-D film and a collection of artefacts from a lighthouse keepers daily life. The closing time varies slightly from season to season. Remember to carry sunglasses. The white facade makes the place terribly bright on a sunny day. By bus: Take ‘busCas’ from the city centre that runs every 10 minutes. How popular is Santa Marta Lighthouse Museum? People normally club together House Of Stories Paul Rego Or Casa Das Historias Paula Rego and Cascais Old Town while planning their visit to Santa Marta Lighthouse Museum. Awesome place, clean fresh, cool, warm and suggest all to visit to experience the light house. If you would like to know how a Portuguese house looked like a 100 years back. Go here. It's just 4 euros and worth a visit. A beautiful view from the lighthouse, but you have to be in shape to climb up the stairs and it’s certainly not for someone who is afraid of heights! The Marta’s building is super nice inside and it’s a nice place to relax in the terrace where they have placed some fatboys. I definitely recommend a visit!